This is a necessary post because I know so many people suffer from anxiety and sometimes it helps to read other peoples ways of coping with it. 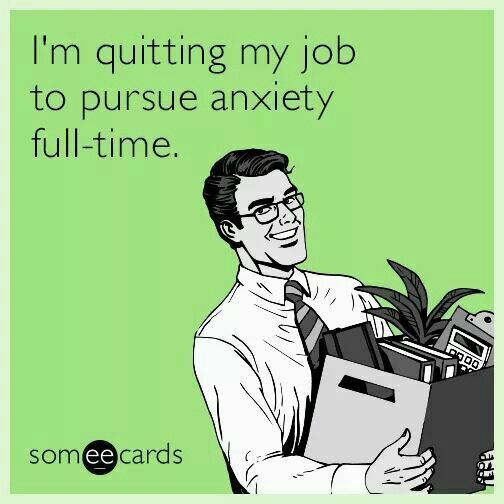 Anxiety is so freaking terrible right? I am a healthy person. I’ve never had surgery. I’ve never broken a bone. I’ve never had a abnormal blood pressure. I have been blessed with amazing health for all my life. I’ve heard of anxiety but I had never experienced anxiety before so I never really paid that much attention to it. It’s not my problem right? Wrong. I didn’t really rushed to the doctor right away because I did also get opinions from nurses you also consider confirm that it was anxiety. But one day I was on my way to the park with my kids on a beautiful, sunny, summer afternoon and my heart just started going out of control. Luckily I was close to the park so I decided to get out and kind of let them play a little bit while I called the doctor to make an appointment. I was hoping that I could get to the doctor while I was having the symptoms so they could really see what I have to deal. Luckily the doctor was able to squeeze me in that same day and I let the kids play at the park for a few more minutes and we headed over there and that was another thing about that particular panic attack it didn’t seem to go away some of mine would last for 10 minutes and then go away but this one lasted all the way through my doctors visit which was just not cool. When I got there it was confirmed that my blood pressure was ridiculously high and my heart rate was almost dangerously high. They checked my blood, they monitored my heart for a little bit and they came to the conclusion that I was perfectly healthy, but that I had anxiety. The doctor gave me two prescriptions to help with the symptoms. One was a pill that I was to take right away in the middle of an anxiety attack to help. Another was a long-term medication, a mood stabilizer to help prevent me from having the attacks. The mood stabilizer was out of control. It got me so high in a really uncomfortable way. I felt disoriented. I felt like I bought these pills from a drug dealer in the back of a dirty alley in New York City. I could not take them anymore. I wasn’t even able to go to the grocery store without feeling so weird and disoriented, so I stop taking them. I didn’t want to be dependent on anxiety medication anyway. The other medication that I was given to take in the in the moment of panic attack didn’t really seem to help either. I feel like it was more of a placebo type of thing. After understanding that I was healthy I just realize that I was going to have to start trying to treat my anxiety by myself. Medication producing the results I was expecting. I was only making me feel worse. So, I decided it was time to try and manage my anxiety myself. It is difficult, and it's a struggle, but I have definitely seen improvement since I began. I know it sounds really stupid but understanding how to breathe instead of panic during my attack really helps me. My first couple of attacks I honestly thought I was having a heart attack and I wasn’t able to just be calm because you can’t be calm when you feel like you’re about to die right? It took me a couple times once I began taking deep breaths in through the nose and out through the mouth during a panic attack I’ve been able to manage them a lot better without flipping out and losing my mind. My childhood friend introduced me to Doterra essential oils, and they have changed my life I have a rollerball that’s mixed with lavender oil and an oil called balance by dough Tara and those two together really are very calming and just make me feel suit and relaxed lavender in general is a very calming sent so even doing lavender candles would be a great alternative for the oils but oils really help me a lot. Like I said before these are my ways of dealing with my personal anxiety and I decided that maybe I wasn’t making enough relaxing time for myself. Moms are so busy taking care of everybody else that sometimes we overlook taking care of ourselves. I began taking candle light showers where I just sit in the shower and stay there till I get wrinkled and just relax. It helps me unwind at the end of the day and has helped a lot. I know so many people have anxiety and there’s so many different types out there so if you have any tips on how you manage yours please share them in the comment section below. I would love to read them and maybe other readers will learn from them. This happens to me as well sometimes. I've noticed that it happens when there's a lot of people around. I get really hot and feel like I can't breathe, then my heart starts to race super fast. So when this happens to me (I'm usually at the store when this happens.) I find an empty isle and just breathe slowly and try to calm myself. One time this happened to me when my family and I were on vacation. We were at a flee market it was right around Christmas time so people were buying last minute gifts. And the place was packed! I don't even know how I did it but I weaved in and out of the "mob" and my parents got scared and thought I was going to get lost.